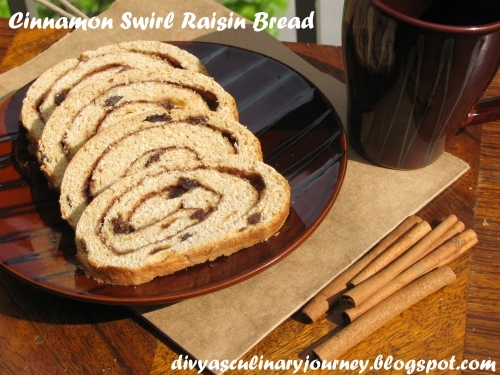 Today's recipe is Cinnamon Swirl Raisin Bread. It is Egg-less and made of whole wheat flour. When I was a kid, my Dad used to buy freshly baked bread specially for me. It will be warm when he brings it home. When my mom gives it to me with Kissan Jam. mmmmmm... divine. Sometimes even the normal milka bread( the one normally available in all grocery shops) mom will toast it with ghee & serve with Jam.. Yum!! Even for dinner I could have that. I was that kind of fan from that age. And also my grandpa(mom's dad) has always had bread (specially ordered for him) for dinner, due to health reasons. I would love to soak that bread in water and have too. But my grandpa is no more with us now. Though its been 8 yrs now, no single day has gone without thinking of him. It is kind of nostalgic when I think of my love for bread. But there are people, who consider that bread has to be eaten when you are sick. Funny !! Coming back to the cinnamon swirl bread, I tried to make it eggless and whole wheat. It was mainly for my health freak Hubby. He was so happy that I baked a bread at home and it is preservative free. Original recipe is from Betty Crocker website. I halved the ingredients and made some substitutions. Since I used whole wheat flour, bread didnt rise much and it was a dense bread, but tasted good. In a large bowl, mix 2 cup of flour, sugar, salt, yeast and set aside. In a sauce pan, heat, water, milk and oil until warm and add to the flour mixture and keep kneading little by little add the rest of the flour and yogurt and knead the dough well until its smooth. Place the dough in the greased bowl ,cover and let it rise for an hour. To this dough add raisins and knead. Then roll out the dough into a large rectangle and brush oil over it. In a bowl, mix sugar and cinnamon and sprinkle them on the oiled surface. Roll up the rectangle and pinch to seal the seams. Slightly press the sides of folded rectangle to seal and place them in a greased loaf pan such that the seams are in the bottom of the pan. Brush oil on top and let it rise for another one hour. Pre-heat the oven to 375 F and bake for 30-35 minutes until the loaves are golden brown and sounds hollow when tapped. Remove from pan and let it cool. Today's recipe is Sweet potato biscuits. But usually if we say 'biscuits' in India, it is a sweetened cookie or cracker. That too Brittannia or Good day.. I never knew there are other kinds of Biscuits. Here in North America, Biscuits are small soft leavened bread, similar to a scone. Wow!! Am learning a lot of new things these days. This is Paula Deen's Recipe. 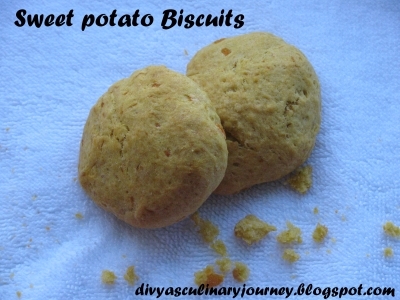 It is made of sweet potato and is Thanksgiving special. We are months away from Thanks giving, but still I had lots of sweet potatoes, so thought to give it a try. My husband liked it though.. But not my daughter. She says if its not sweet, its not biscuit. It was super duper easy to make and was very quick- thats what I liked about it. But there is a debate whether to have this biscuits for breakfast or dinner , for us it is snack.. :) How do you like to have your biscuit?? Sift together flour, sugar, baking powder and salt. In a seperate bowl, mix sweet potatoes and butter together. To this mixture, add flour and knead to make a soft dough. If the dough is not soft enough, add milk little by little, to get the desired consistency. Then roll out the dough, in a floured surface about 1/2 - 3/4 " thickness and use a biscuit cutter to cut it out and place it on a greased baking tray and bake for 15- 20 minutes. I did roll out the dough to cut it with the cutter but then as the remaining dough was there, I just rolled it out using hands and pressed it with fingers, that saved a lot of time. The one did with hand was rustic and very flaky. As I was trying to take pictures of the biscuit, my son grabbed one.. captured candid.. This what happens most of the time when I try to click pictures.. Theeraatha Vizhayattu pillai.. 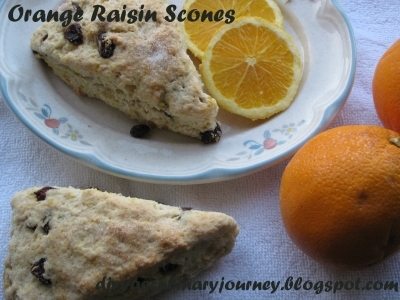 I baked Orange Raisin Scones today. Scones are small british quick breads. It was quick to bake and was very easy to make. It was mildly sweet and adding the orange zest gave citrus aroma. It is perfect with tea. In a bowl mix orange zest, flour, sugar, baking powder, baking soda﻿ and salt. Then grate the butter into this mixture and use fingers to incorporate it to the flour. In a bowl whisk sour cream and eggs until its smooth. Then fold in this mixture with the flour mixture and mix the raisins until they are fully incorporated in to the dough. Then flatten the dough into 8- 10 inches wide diameter for about 3/4inches thickness. Cut the dough into 8 equal parts. Arrange them in the baking tray with 2 '' apart. Sprinkle some sugar on top of them and bake for 15- 20 minutes until they are golden brown. Let the scones cool down a little bit and serve with a cup of tea. 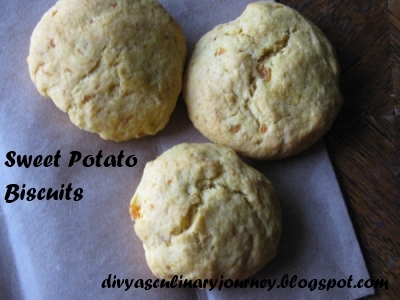 Today I am posting Potato Stuffed Buns (egg-less) . I first had an idea to bake just the plain bun. But the day i baked, I made potato masala for lunch and there was a lot extra, so I decided to use it for stuffing the bun. 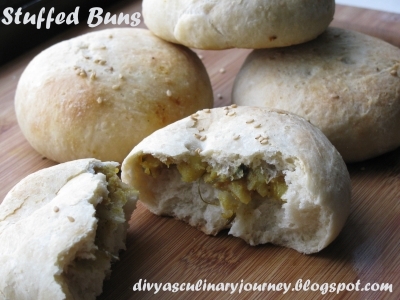 Stuffed Bun can be a perfect tea time snack or light breakfast / lunch. It is delicious to have with tomato ketchup. Prep time: 2 hours; Cook time: 20 mins; Total time: 2 hours 20 min; Yield: 6 Buns. Heat oil and add cumin seeds, then add ginger garlic paste and cook till the raw smell is gone. Then add turmeric powder, chilli powder and cook for 1-2 min. Then mix well with mashed potatoes, add salt to taste and garnish with cilantro. In a bowl combine 1 cup of flour and yeast and set aside. In a sauce pan, heat milk water, butter, salt and sugar and stir until warm and the butter is melted. Add this mixture to the flour and mix well. Then add rest of the flour little by little and knead. Then add 2 tablespoon of yogurt and knead to get a soft dough. 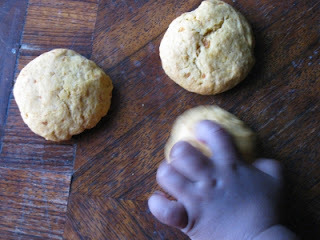 If the dough is hard, add water, little by little and keep kneading till u get the soft dough. Then let it rise for 2 hours. Gently deflate the dough and turn it to the other side and rest for 30 minutes. Divide the dough into 6 equal parts . Flatten them fill them with 1 Tbs of filling and roll them back to a ball and flatten them a little bit. Arrange the prepared balls of dough in a greased baking tray, leaving 2" gap on each side. Let it rise for 30-45 minutes. Pre- heat the oven to 375F and apply butter to the top of the bun and bake for 15-17 minutes until its done. Once removed from the oven, apply rest of the butter to it. 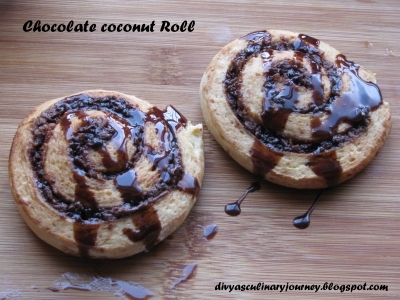 Today my recipe is "Chocolate coconut Rolls". When I decided to do the marathon under bread baking I started hunting for recipes. When I came across this recipe, I thought it was so complicated but the coconut and chocolate tempted me to try this. But then I realized it is very easy to make. As I will be baking few more breads, I tried only a very small batch but the recipe can be doubled if required. In a bowl combine one cup of flour and yeast and set aside. In a sauce pan, heat and stir together milk, sugar, salt, and butter until warm and the butter is melted. Add this mixture to the flour mixture and mix well. Add a lightly beaten egg to this and add the other cup of flour little by little to this and keep kneading till they are all incorporated into a soft dough. If the dough is dry add a little water ( may be 1 Tbs at a time) and keep kneading till u get the soft dough. Cover the kneaded dough and let it rise for 1 hour and turn it the other side and let it rise for another half an hour. Roll out the dough into a rectangle of about 1/4 " thickness and spread the hazelnut spread over the dough leaving one inch in one long side of the dough. Then sprinkle coconut on top of this. Then roll up the rectangle from the long side where fillings are spread to the edge and pinch the dough to seal seams. Slice the rolled dough uniformly (about 12 slices) and arrange them in the greased baking tray almost 2" apart,cover them and let it rise for 45 minutes. Pre-heat the oven to 350 F and bake for 15-20 minutes until golden brown. Let it cool and drizzle chocolate syrup on top and serve. There were few ripe bananas sitting in the fruit basket. Quick bread was the quick choice. 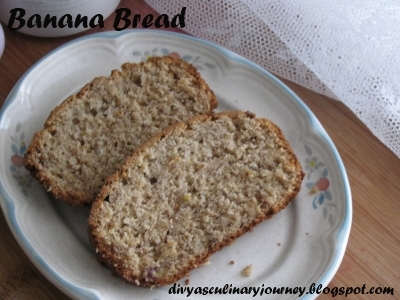 So baked this Banana bread. It is a delicious breakfast recipe. Preheat the oven to 350 F and prepare the 9*5 inch loaf pan by greasing and dusting the flour and set it aside. Mash the bananas well. Melt the butter also lightly beat the eggs and keep them ready. In a bowl combine all the dry ingredients together. (Flour, Sugar, Baking powder, Baking soda,salt and ground cinnamon). In another bowl, add the mashed bananas, melted butter, eggs and vanilla extract and mix them together. Add this mixture to the flour mixture and mix them till they form a homogenous mixture. But donot over mix the dough. Place the dough in the prepared loaf pan and bake for 55-60 minutes till the bread is golden brown and the tooth pick inserted in the centre should come out clean. Let the bread cool down before removing from the pan. Let the bread rest overnight and then slice and serve. It is first day of Chithirai!! Tamil New year!! Today we had planned a lot to cook, but Hubby had to leave early to work. So immediately I made this kheer as I wanted to start the day/ new year sweet. Once he is back in the evening, with items planned will do the pooja. This is such a simple dish but very yummy, easy to make too. Take a table spoon of sugar and powder cardamom with it. In a tea spoon of ghee, fry cashew nuts and raisins. Set aside. Soak saffron in warm milk for few minutes. In a sauce pan, add a teaspoon of ghee and roast rava till the raw smell is gone and it changes color lightly. Then add milk to this rava and stir constantly to avoid forming any lumps and let it simmer for 15-20 minutes. 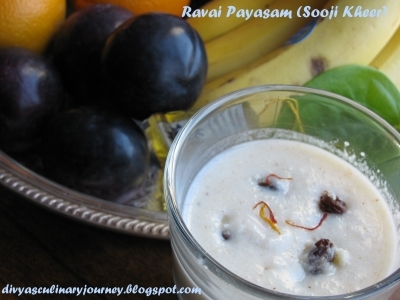 As per the desired consistency, check payasam and add water and simmer for few minutes. Add condensed milk to this and mix well. Add rest of the sugar and mix well. Finally, add the powdered sugar, soaked saffron and mix well and Garnish with fried cashews and raisins. Based on your personal preference, payasam can be served either hot or cold. When I came across this whole wheat Ragi chocolate cake, I was immediately hooked to it. It is sugarless, made with wheat flour and Ragi Flour (Finger millet) and also it is chocolate cake, what more do you need?? I made few changes to the original recipe. 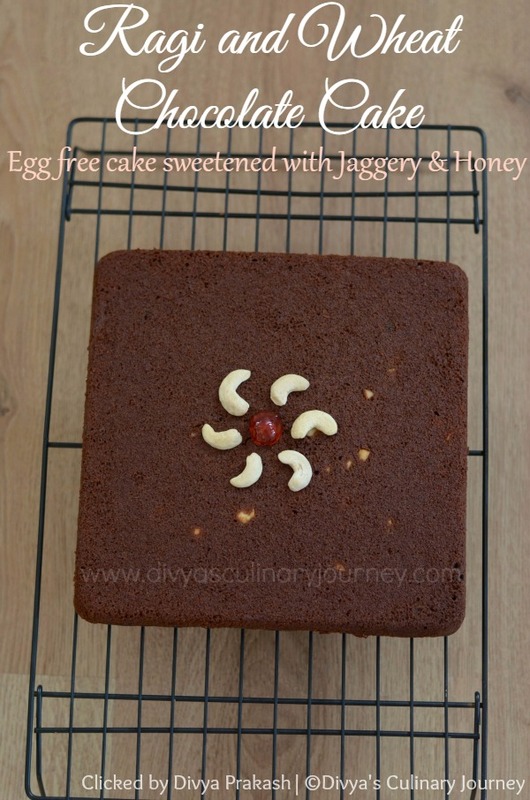 This cake came out perfectly well - so soft and moist and no one could tell its made of Ragi. Lots of goodness in this delicious cake. I am glad that I tried this recipe. Edited on 26th November, 2015: Since my first try I have made this cake many times. Every time this cake has received very good response from everyone. I made this cake today for my son, who loves chocolate. This time, I added nuts and dry fruits as I made it as a snack cake. 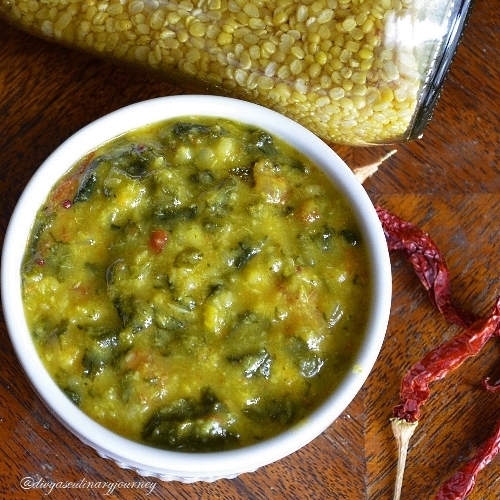 This is a very simple dhal, I make almost once a week. I use frozen spinach (too lazy to clean the fresh one). 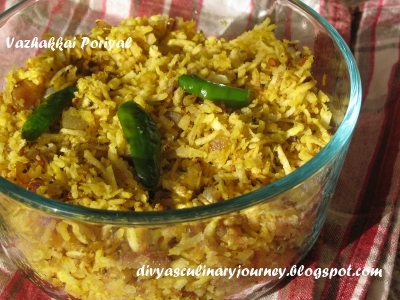 It tastes absolutely delicious when served with warm rice and ghee. Fried potato makes a great combination for this. This dhal can be served with roti too. 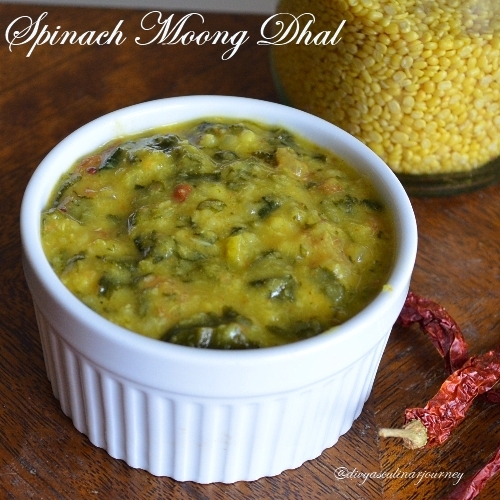 In pressure cooker, cook moong dal with tomato and garlic. In microwave, cook spinach for 5 minutes. Then in sauce pan, add oil and then mustard seeds & cumin seeds, once they splutter add onions.Cook till the onion turns golden brown. Then add asafoetida, turmeric powder, chillipowder cook till raw smell is gone. Then add spinach and cook for 2-3 min. Then add cooked moong dhal to this. Add water as per the required consistency. Then simmer for 10- 15 min in low flame. Today the weather was a little cold. We went out for egg hunt this afternoon and came back home. We didn't have any other plan for the evening. 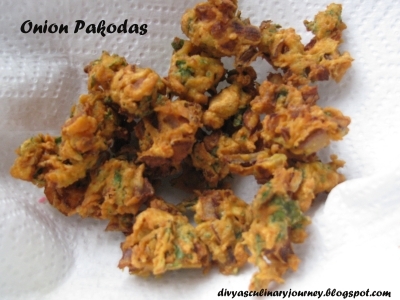 Chilly weather and lazy evening - what else reason you need for pakodas?? Onions (finely chopped), 1 no. In a bowl, combine flour, turmeric powder, chilli powder, asafoetida ,salt and to this mix onion, curry leaves & cilantro. Add water little by little to this mixture till they are incorporated well. Then add butter to this and mix well. Heat oil in a deep pan and drop the spoonful of batter one after the other into the oil. . Avoid overcrowding as they will not result in crispy pakoda. Fry them till they are golden brown. Drain them on paper towel to remove excess oil. 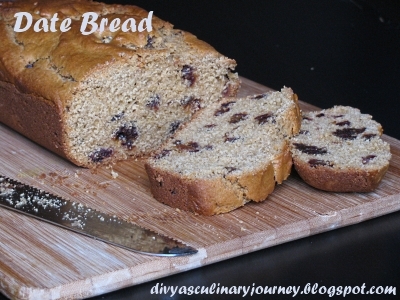 Today I am sharing here Dates Bread recipe. It is a quick bread made with whole wheat flour loaded with dates. It is perfect for healthy snacking. I am so much into baking these days that any dish that involves baking catches my attention first. Most of the time, the new dish I try will be baked one. 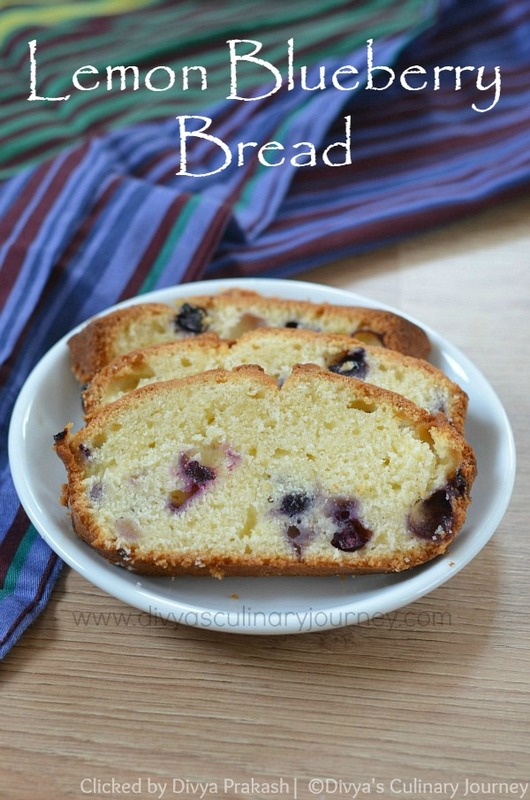 So when I was thinking about what to make for our trip, quick bread came to my mind. Had lots of dates left so decided on this dates bread. I had also made banana muffins- will post that recipe soon. This was our breakfast along for all the three days. Bread was in a rich golden color and was very soft. It stayed soft too. Kids loved it. Since it is made out of wheat flour, light brown sugar and dates, green signal from Hubby too. In a bowl mix all the dry ingredients(flour, sugar, salt, baking powder and baking soda) together. In another bowl mix egg, milk, oil and vanilla extract. Add this egg mixture to the flour and mix it till its forms a homogenous mixture. But dont over mix it. Finally fold in the chopped dates. Pre-heat the oven to 350 F Grease the loaf pan and spoon the batter to the pan. Bake for 45-50 min or until the toothpick inserted in the centre comes out clean. I used a 9*5*3 inch loaf pan but u can also use 8*4*2 inch pan too. Bread tastes better the next day. After cooling the baked bread, wrap it and store overnight. Cook vazhakkai with its skin on, till its completely cooked but still firm. Dont over cook it. Then remove the skin and grate it. Cut garlic into small pieces and grate ginger too. Heat oil in the skillet and add mustard seeds.Once they splutter, add urad dhal, chopped onions, slit green chillies, curry leaves,garlic and ginger. Also add asafoetida. Cook till the onion turns into golden brown then add turmeric powder. Cook till the raw smell is gone. Then add the grated vazhakkai , salt and mix well. Remove from heat. Finally add the grated coconut and mix well. Serve them with rice and gravy of your choice.